I've finished painting ALL the Shadespire Orruks! A whole plastic force, fully painted, with modern miniatures, for a current Games Workshop game. WHAT HAVE I BECOME?!?! Gods of Oldhammer, I have forsaken theee! Ironskull's Ironjawz tearing up the Realm of Shadows. Initially I planned to just copy the ‘Eavy Metal banana-yellow paint scheme, but I switch the Orruk fleshtone from green (which sits awfully with yellow) to a nicely contrasting purpley-brown. I blocked out the basecoats, confident I could ignore Jean-Baptiste's "never go full banana" advice. Ring ring ring ring ring ring ring banana phone. Basha was the first Orruk I painted to completion – and he took bloody ages. Yellow is notoriously translucent and takes a lot of layers to build to a strong colour. Bright colours also show up the flaws in the shading and highlighting. 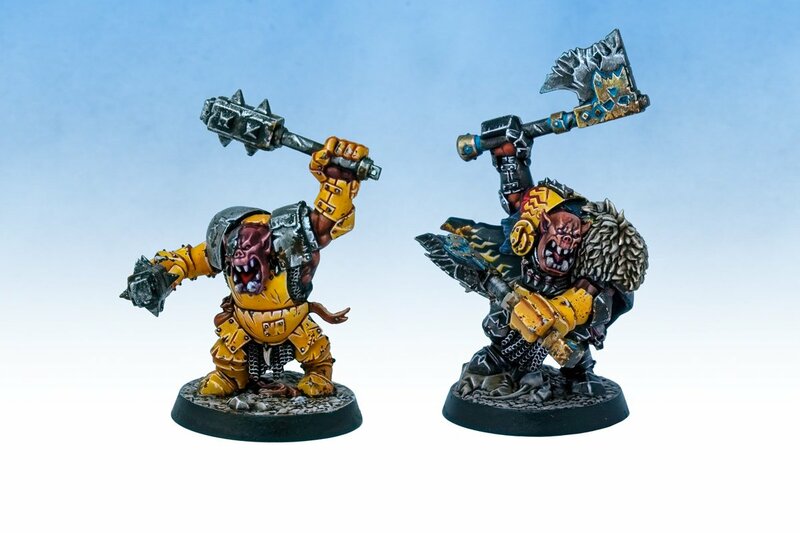 Pity anyone that's doing an entire horde army of these buggers in yellow. 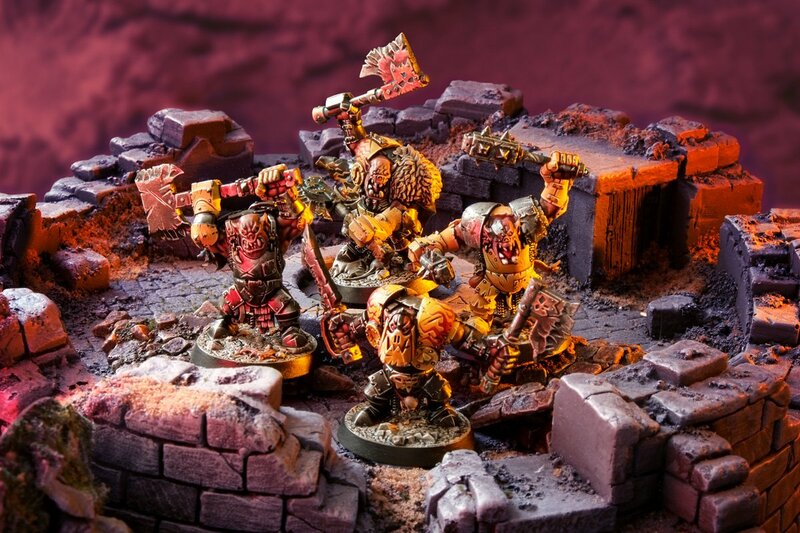 Though I was pleased with the brashness – I needed da boyz on the gaming table and wanted to slash the time spent on them. 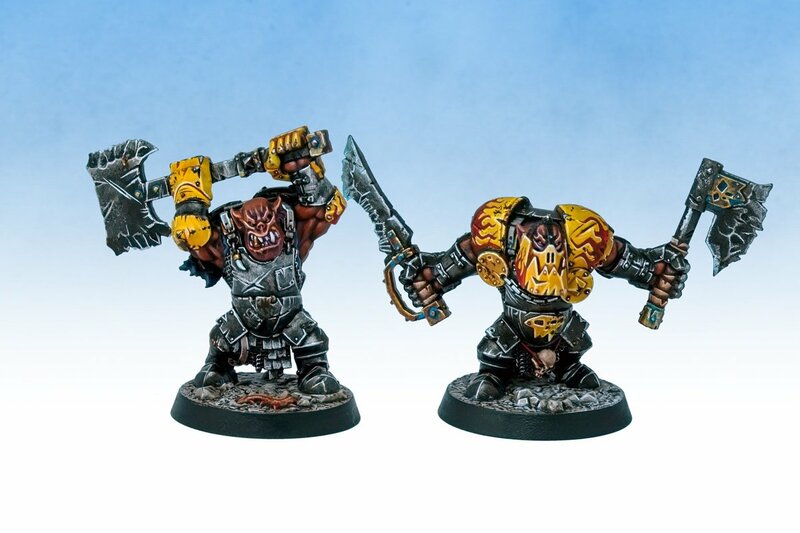 Gurzag and the other Orruks had their armour colours reversed. The dark steel colour is simply drybrush, wash and a quick edge highlight in bright silver. It takes a fraction of the time of the yellow as there's no glazing of midtones to eat through time. I spent a bit of the time saved putting flames on Gurzag's cloak. 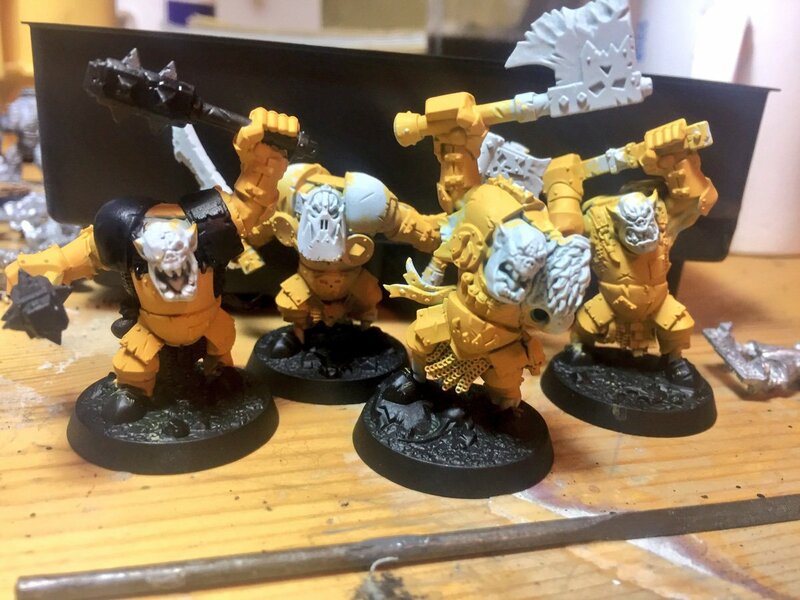 Reducing the amount of yellow makes the Orruks look far more menacing, and gives what yellow is there greater impact. Basha's all-yellow scheme does push him towards looking like a kid's toy, or a construction vehicle. Which I quite like anyway. I had a lot of fun with Hakka, freehanding the flames onto his shoulderpads and jaw. 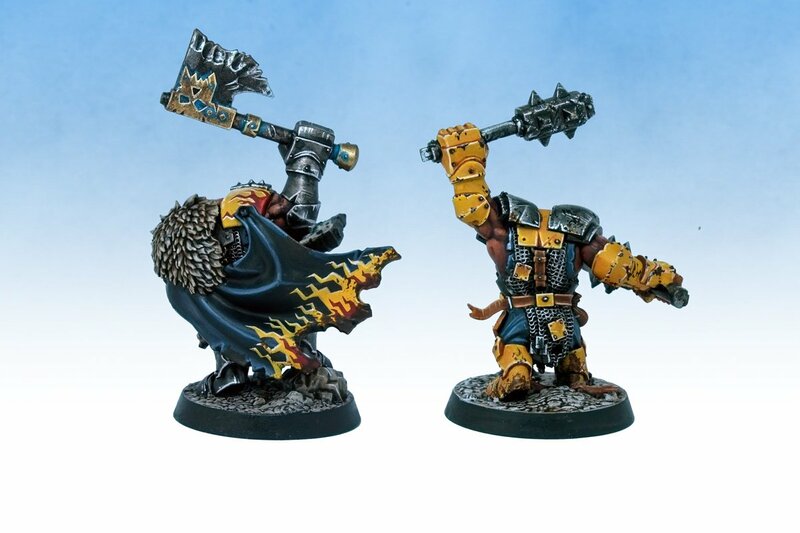 He's my favourite miniature in the gang as the colour scheme draws your focus towards his head and cool mask. I've really enjoyed painting these, and like that they're instantly a finished project, ready to rumble against the likes of asslessman, Tears of Envy and Mr Saturday. More of my miniatures at here! More of my Warhammer Fantasy miniatures here! Wow, spectacular! It's hard to pick between the schemes, they all look so good. Very nice looking. Just enough yellow in there to keep the force coherent and give them some pop without it being overwhelming or in any way silly looking. 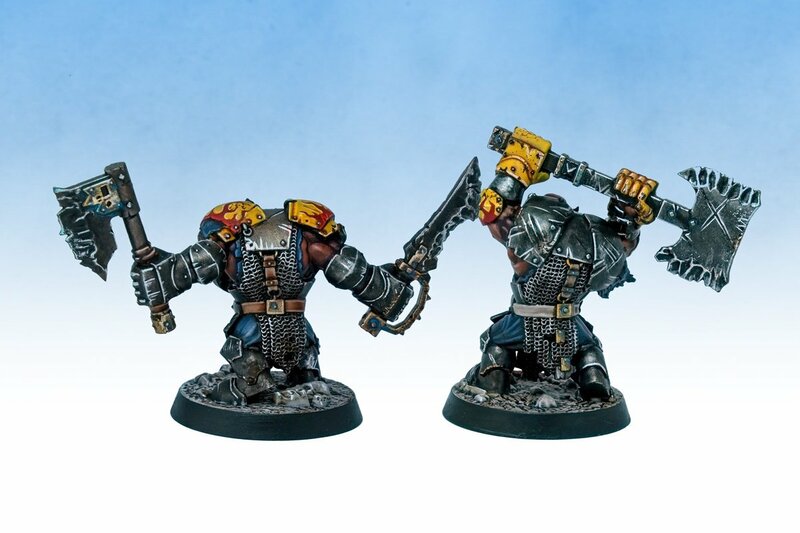 Just like how orcs should look. Amazingly good job there. But … but … they are greenskins after all. No self respecting Orc would take the time to lounge around on a beach and get a tan! lovely paint job.. horrible minis though. I know you normally paint oldhammer stuff have you ever turned your awesome skills on any old Kev "Goblin Master" Adams orcs and goblins? I'd love to see that. While I love green-skinned orcs, I simply adore your solution to get better contasts with the yellow armor. Simply brilliant!